It's that most wonderful time of a mostly blunder-filled year. At last we get to turn our backs on a very gloomy 2008 and face 2009 with chins up. It's gonna get brighter, right? Making merry again in Victory Park will be WFAA8's madcap quartet of Dale Hansen, Pete Delkus, Cynthia Izaguirre and Gordon Keith. 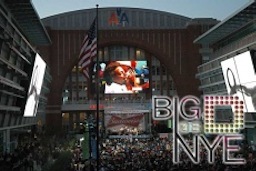 Starting at 11:05 p.m., they'll preside over what's becoming the station's annual Big D NYE celebration. On last year's sometimes slap-happy presentation, Hansen and Delkus welcomed Izaguirre as the new Daybreak co-anchor. At the time she was partnered with Justin Farmer. "He's run off about five or six women . . . Get rid of him if you can," Hansen twitted. Consider it done. Farmer and Izaguirre lasted just one day together-- her Jan. 4th debut -- before he became an Atlanta-bound lame duck. WFAA8 held Farmer to the rest of his contract but stopped promoting him until he finally left for WSB-TV after the Friday, Aug. 1st edition of Daybreak. Farmer's replacement, Brad Hawkins, now is gone, too. He departed WFAA8 on Christmas Eve to take a PR job with Dallas-based Southwest Airlines. So as 2009 dawns, maybe Hansen should jokingly tell Izaguirre, "Stop getting rid of 'em, willya?" 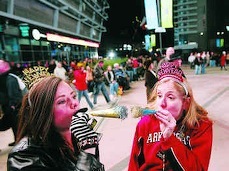 We close with the Hansen/Delkus/Izaguirre clip from the 2008 Big D NYE special, and with thanks to all for sticking with good ol' unclebarky.com.